Are you ready for some glitter loveliness?? Today I have China Glaze It’s a Trap-eze! to show you, this was sent to me by my lovely Canadian Polish buddy, Adina, from Blue Collar Red Lipstick. This is from the Worlds Away Cirque Du Soleil Collection that came out in late 2012. There were 12 polishes in this collection, including a couple of glitters. Anyway, let’s go! Having spent a lot of time recently removing glitter from my poor abused nails, I decided early on that a layer approach was probably best. I went straight to the best white polish in my collection, which is Tempest from Cult Nails. This is a great white polish, goes on smooth and levels well, making it ideal on its own or as a base colour. I then used just one medium thickness coat of It’s a Trap-ese, yes just one coat. Look at that glitter!! Completely in love. I am a little obsessed about white polishes with glitter at the moment, plus I needed something I could wear for a couple of days. This was perfect for that. I prepped by nails by base coating with Essence Better Than Gel Nails Base coat. I do like this product, dries quickly and seems to provide great anchorage for polish. In fact, I reckon its getting very popular as my recent trip to Holland turned up a massive blank when trying to buy more bottles!! Anyway, the polish itself it white tinged, and I know from other blogs that if you layer it carefully you can get opacity within two or three coats. I think it really shines when you layer it, such as this. It dries quickly and its packed full of glitter in lots of different colours, orange, red, green, yellow, blue, silver and white. It appears to be in two sizes, small and large. I sealed the whole thing tight with a thick coat of Seche Vite, but it wasn’t too bumpy at all before the Seche. What do you think? Are you over or into white polish and glitter?? This is a polish I have worn a couple of times but neglected to take images. So here, third time lucky, is China Glaze Immortal from the Halloween 2012 collection. As you can see, this is a slate gray polish with hints of shimmer within. There is a hint of pink and blue, its a super wearable colour and goes with most things. Application was good, I used three thin coats to build up opacity. I base coated with Seche Clear, top coating with Seche Vite to make it last longer. Formula was good, not too runny and not too thick. Drying time was quicker than average. I love these gray polishes with shimmers, I have quite a few, I’m getting a bit obsessed. I’m not sure if Immortal is still available, but you can pick up China Glaze polishes from eBay, Amazon and other online retailers. Let me know your hot links if you find any! Woohoo! More Megalast for you today. This is another one from the Pick your Poison collection. And its a beauty! Above is two coats over Essie All in One base and top coated with Seche Vite. It is awesome, in colour and formula. It is a great colour, a mulberry colour with a silver ripple. Lovely. Formula was fantastic for a budget line, really impressed. Drying time was super quick and wear was great. After about 24 hours, beacuse it was still immaculate, I popped a coat of China Glaze Glitter All The Way from their Holiday Joy 2012 collection. Looks like the Super Plum fairy threw up on my nails! Ray-diant is one of the Prismatic Chroma Glitter range that China Glaze came out with earlier this year. Its a lovely pale green and silver glitter bomb of delight. In fact there is quite a lot going on in this bottle! I’ve had the pictures for a while now, I cannot believe I forgot about this one! There are flashes of pink, blue, gold, more silver. Its like a pale mint green discoball. Formula on this one was nice, flowed well onto the nail despite all the little bits. What you see in the pictures is three thin coats. Drying time was super quick. It does dry a bit gritty, so if you don’t like that in a polish, you will need a good thick top coat. Wear was also good, I got three days out of it before I chipped it. But, be warned, removal is a bit of a pain! I recently got another one from this collection, Polarized, so keep your eyes peeling for swatches very soon! In the UK you an get China Glaze from Sally Beauty Express, Amazon or via resellers on eBay. Retail is about £7 per bottle depending on where you purchase. China Glaze has pulled a complete blinder with the polish collection related to the cinematic release of The Hunger Games. Capitol Colors is made of 12 shades, each one reflecting something within the book series. To be honest, I have no idea because I have never read them. Riveting is a intense saturated orange shimmer. In the bottle its mesmerizing, on the nail is phenomenal. The formula was a dream, three thin coats with a great consistency. Within two coats it was fully opaque but I did three because it was drying so incredibly fast. I cannot stop looking at my nails as the colour is so eye catching. I also treated myself over the weekend to Seche Vite, the top coat I have heard so very much about. Not disappointed in the slightest. Go buy it now, and order Riveting online! I don’t have a lot of China Glaze polishes, mainly because there are not that easy to come by the UK, unless you happen to be near a Sally Beauty Supply that stocks them. There are generally about £7 but there are places on the internet where you can get them for less. I bought In the Limelight as part of a 3 for 2 Sally Promotion when I had ordered the Ghoulish Glow top coat (which they sold me and then couldn’t get it in stock, but that’s by the by). I had planned to use this under black crackle as part of a Halloween manicure. It was part of the Ink Collection from 2008. So, it was St Patrick’s Day, a day for all things Irish. I decided that I would pull it out and give it a go. In the Limelight is a neon polish, very thin in formula and takes about 3 to 5 coats to get some sort of even colour. You can see a bit of drag on the base of my nails, not the most easiest polish to work with. Its a bit of a pain but it dries super quickly. It feels very silky to the touch on the nail. Its a very vibrant green, super saturated and almost glows. A good glossy top coat does bring the colour out much better. All in all, not the best China Glaze polish I’ve ever come across, but good to use in layering, which I did with Nail Junkie and Kissy Sinful Colors. Following on from last weekend’s polish purchases I finally got around to using one of them. I picked Meteorite, a blue shimmer, from the Max Factor Max Effect Mini Nail Polish releases for 2012. This is a really lovely color, a dark cornflower blue with just enough sparkle to satisfy. My biggest bugbear with this, isn’t the colour or the formula, but the brush. Its small and short, not big shock seeing as the bottle is tiny. As the Julep brush is long, this is short. Formula was lovely, I could have gotten away with two coats, but chose to use three to ensure even coverage. Lovely, smooth, easy to use and quick drying. Its not the most unique of colours, its not as blue or as shiny as China Glaze Skyscraper. Its not particularly gritty either, which is nice if you avoid glitters for that reason. One coat of top coat certainly brings out the colour and shine. Its more blue and less purple that the images might suggest. And for £3.99 you can’t go far wrong and its cheaper than purchasing CG in the UK, which retails around the £6 mark. So, I’ll ‘fess up here. The following nail polishes were NOT bought in NYC, these were some I picked up in our local Sally Hair and Beauty when they were running a China Glaze 3 for 2. These are from the Holiday 2011 Let it Snow collection. Firstly, I used Glittering Garland as my sparkle base coat. Wow, what a stunner and what a polish. Lovely, smooth and buttery. Gliding on and drying quickly. Fab. A really winner on all levels here. Then I used Twinkle Lights, trying to spread a light smattering over the top. This failed as the sparkle was much denser than I anticipated, so it was a bit of a thicker coat. 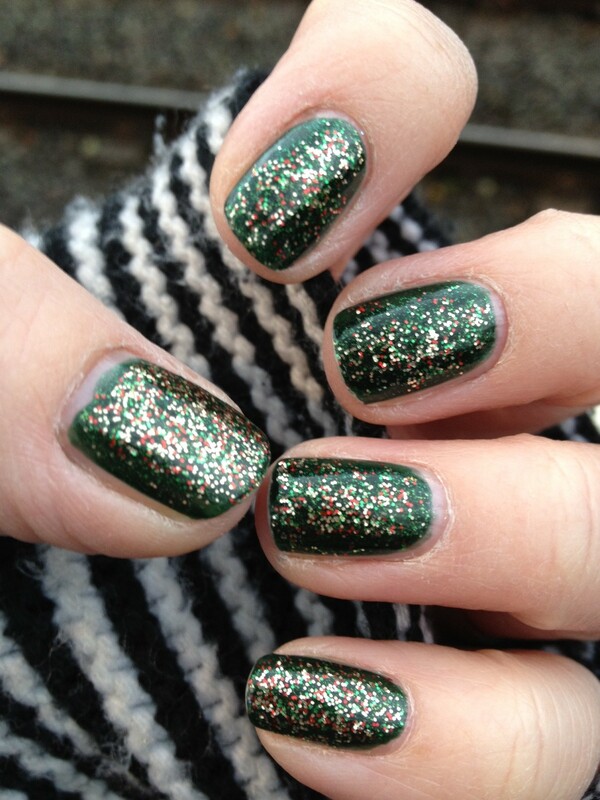 However, its jam packed with small micro glitter of gold, red and green. So very Christmas! So, here is the result, waddyathink? ?